6X8 oil on canvas 100. These are some of the smaller birds nests. All are different in some way. The inner linings are quite wonderful...for example, the right front one is very shallow - about 4 inches across and completely lined with soft feathers and lint. I have to find out what type of bird makes this nest as comfort is obviously important! A thought just occurred... maybe the egg shell is very fragile for that particular bird and a very soft lining is important? Anyone know? A couple of the nests had whole eggs still in them and some had broken shells. My friend Linda brought me two of this type of nest and they both totally amaze me. They are a full 7 - 8 inches deep and constructed so beautifully I almost thought they had been woven with a loom. This one is made of thin strips of shredded blue and white plastic mixed with maybe dryer lint and fine strands of grasses. Very soft and pliable. Hard to believe a bird could do it. When they make the nest they apparently weave it in and out of some of the branches supporting it so it will withstand lots of weather conditions. Mixed in with the blue are some orange threads. These birds must know about complimentary colors! 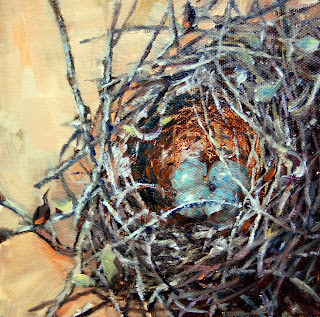 Tiny Nest 8"X6" oil on canvas $100. 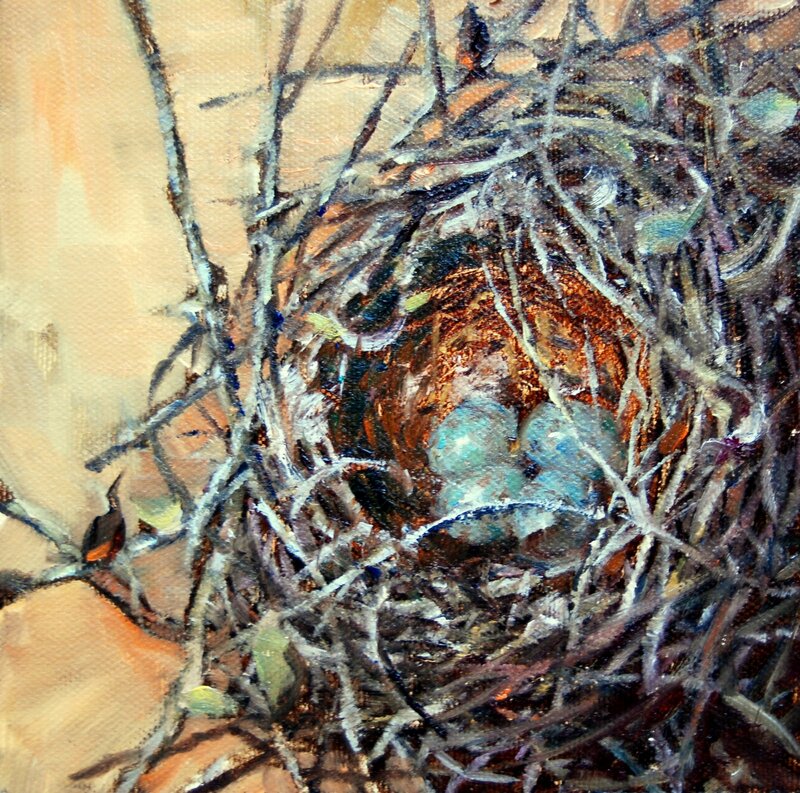 After three days of painting flowers it is good to be back to the bird nest series. This tiny nest is only three inches across. Made carefully with tightly woven, thinner branches than the larger nests and is lined with dead leaves. Most of the leaves inside appear to be from the berry weed I have painted behind it. I also thought I had better paint something which would show the scale of the nest. I do not think this is a humming birds nest...but not quite sure. 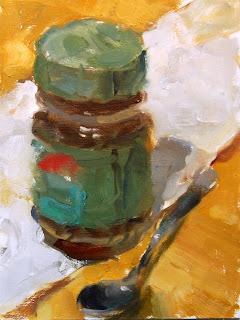 oil on canvas 6"x8" $80. The freesias are opening up along the stem. The tiny end buds do not seem to open when they are from the store but when I grow them in my garden every single bud opens up. This piece was a rush job as I worked on some larger paintings today and almost forgot that I am trying to do a small painting a day. 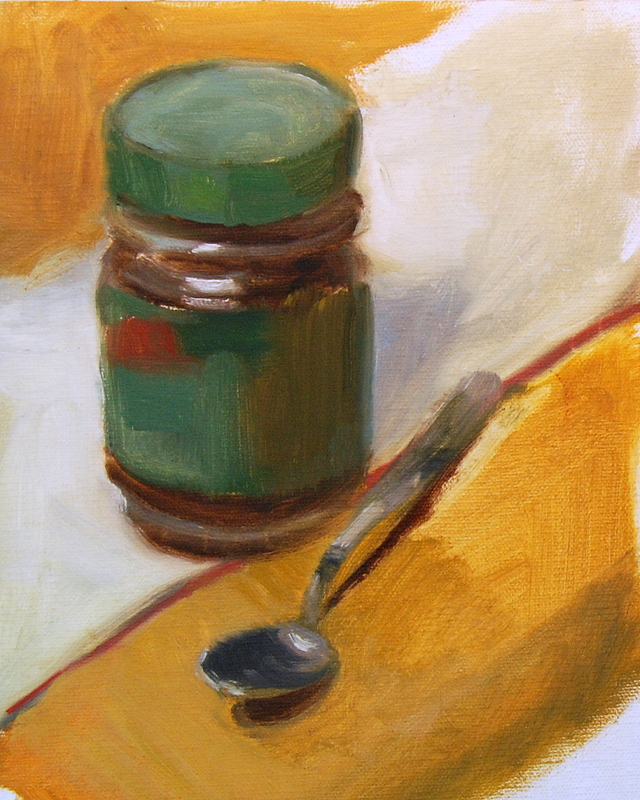 I painted this study very quickly - going for the basic shapes plus light and dark patterns. It certainly is a good way to not get into too much detail. Tomorrow I will get back to the birds nests. 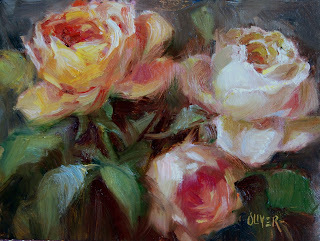 Rose Study 6"X 8" oil on canvas $100. I guess the nest series will have to wait because the flowers certainly will not. Just picked yesterday these roses were wilting by the time I had finished painting them. impression of them and started to capture every detail. The trouble with having a background as an illustrator is detail is what the client usually wanted. I am working hard at suggesting detail instead of a photographic image. My friend Peggy arrived for a visit bringing me some beautiful Freesias. As much as I am enjoying painting the birds nests it was great to get involved with color and different brush strokes. My admiration keeps growing as I examine these nests. What amazing skill. I wonder if the branch that usually goes across the top in some way is for the bird to land on when they feed their babies...or protection? The bottom egg had already been hatched before whatever happened to cause the nest to fall. This is another mocking birds nest and it is beautifully crafted. I am noticing differences in the substance and quality of different nests. I guess some birds of the same family make better nests than others. with thicker, juicy strokes. Which one appeals to you most?